PLEASE BE ADVISED UNLESS THE REGISTRATION FORM IS USED, FOR SALE ADS WILL NOT BE LISTED/DISPLAYED. A superb example. 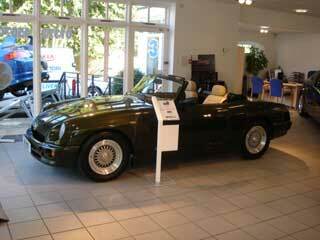 Finished in Pearlescent Woodcote Green - a £750 option - with Stone Leather trim. An epic and detailed history file showing significant experience expenditure over the years showing preventive maintenance resulting in MOT's over 11 years with no advisories at all. This has been a pampered car. Rust proofed and waxoyled many times and the bodywork above and below is totally rust free and very solid. New hood three years ago, and factory Burr Elm veneers fitted 4 years ago. Official Heritage Certificate. Spax shockers at 20,000 miles and recent new tyres. Original MG tool roll and a full service history through Clive Wheatly ( UK leaders on MGRV8). VERY FEW ARE BETTER THAN THIS AND PRICED COMPETITIVELY. 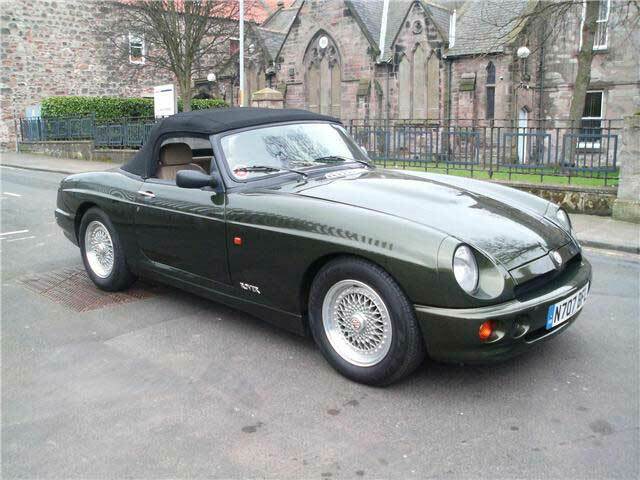 , Full service history Next MOT due 06/09/2019, Green, 4 owners, £21,500 History or Comments: Detailed FSH available. Very nive RV8, original delivered in Japan, imported to Belgium in 2008, one owner since. Only 76K km from new. 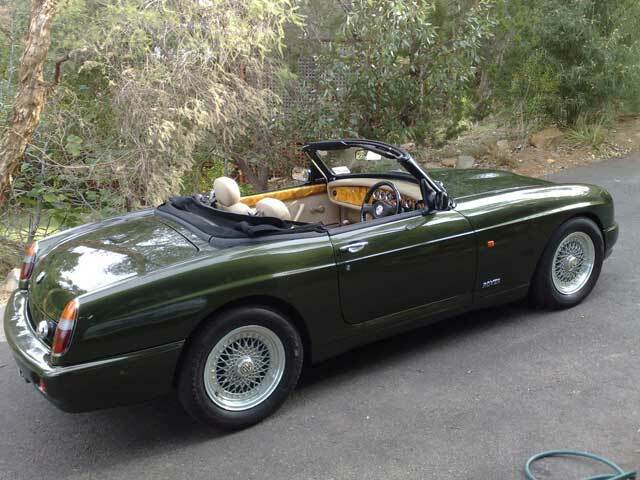 Very good overall condition, runs and drives very nice. MGR V8 27k Miles 1995 full service history since new. 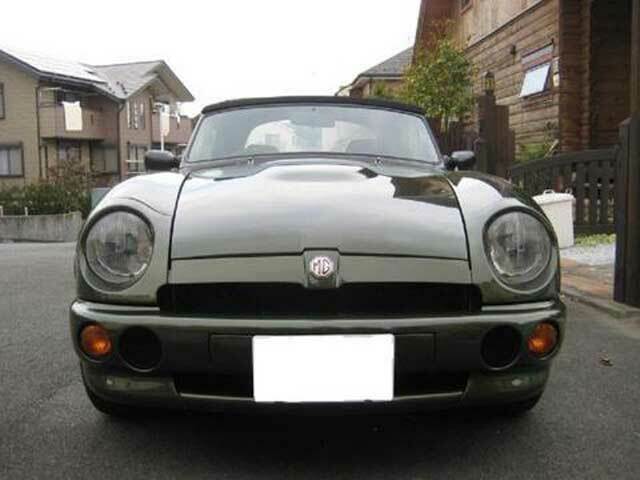 Reimported from Japan in 2005 Garaged Superb Condition Four new tyres and battery Motolite Steering Wheel Full documentation since new. 3 Owners Last owner 12 years. Serviced annually. Excellent all round condition, low mileage (38,000 kilometres). 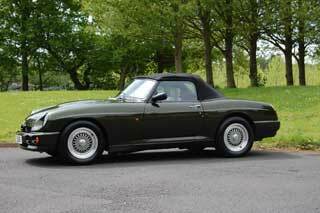 Chrome gear knob, gear stick gaitor, hand brake cover and door grab handles covered in dark green leather, stainless steel & chrome rear exhaust box - Porsche Boxster style, carbon fibre radiator cover and heater box cover. 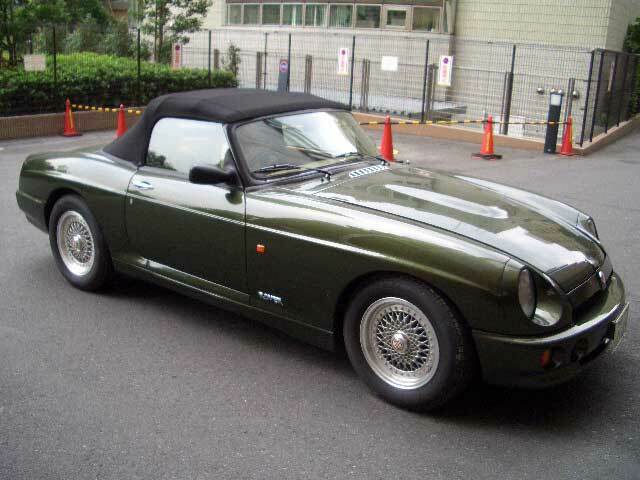 Car manufactured Nov 1994, exported to Japan, reimported to UK late 2002. 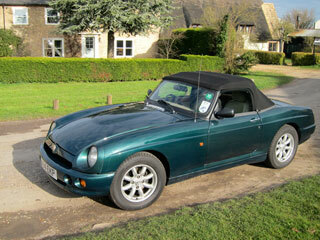 I am the second owner, brought the car to Cyprus with me in 2003 where it has done very little mileage. 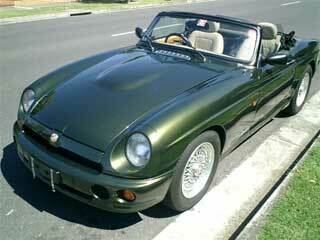 The hood is in average condition and will need replacing in the future. "Firestone" tires; Daytime Running light kit (required for certification in Canada); fuel and oil filters; distributor cap/rotor/spark plugs and leads/remote ignition module kit/stepper motor; brakes (new rotors, pads, clips, drums, shoes, wheel cylinders, flex hoses) trunk (boot) lid struts recharged; hood (bonnet) gas struts installed; Silicone coolant hoses; battery; alternator upgraded (original rebuilt and included); "Tornado" ECU chip; fuel injectors; fuel pump; radiator cover; full tonneau cover; shifter-gaiter; "Burr-Elm" shift knob (original included); gas adjustable shocks; bump stops; used UK AM/FM stereo (original Japanese-spec stereo included; 4 speakers; "Moto-Lita" steering wheel (installed by PO. Original not available); original & complete tool kit in trunk (boot); original Japanese flare. Air conditioning system works very well. Car is in excellent overall condition. Japanese re-import with Original documentation and tool kit. Two sets of keys and full spare wheel. 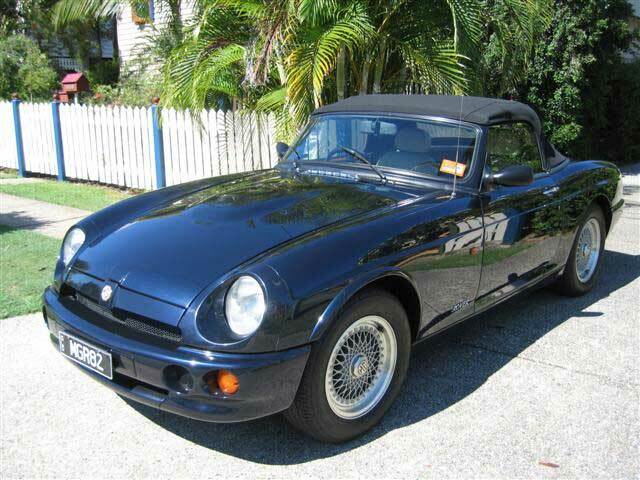 Rare MG RV8 Oxford Blue. Japanese re-import with full, original certification in excellent condition. Brand new M.O.T, six months tax. Rarely used, hence sale. In need of slight TLC but still excellent condition. 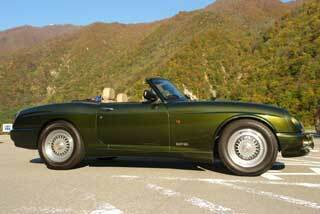 This is a gorgeous example of an incredible motor car. 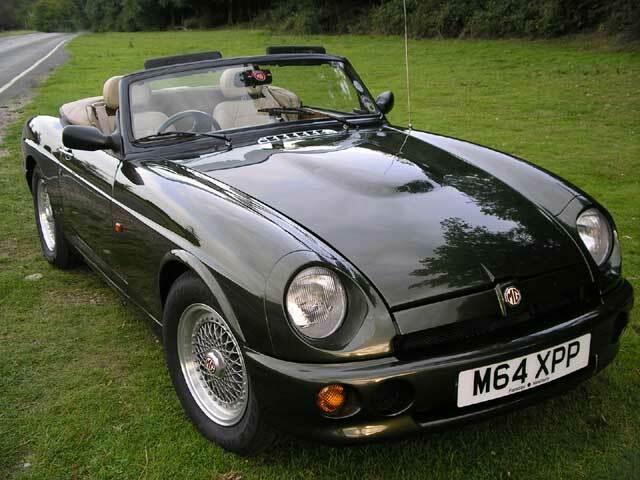 1995 UK specification White Gold MG RV8 One of only 12 ever manufactured in this colour, first registered on the 12th of September 1995 making this car one of the very last to be manufactured. This car is a one previous owner vehicle that was one of a collection of 8 toys owned by its engineering company director who kept all of his cars in a central heated garage within a humidity controlled bubbles. 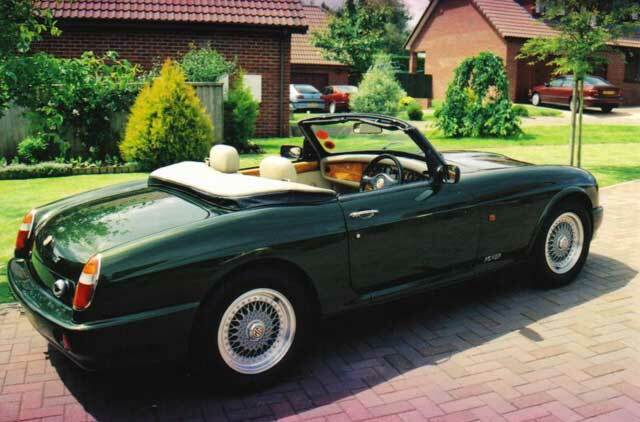 The car only became available when its previous owner decided to downsize his house to one only had a triple garage, so some of the collection had to go. This car has never been rained on and is only ever taken out on sunny days to show’s, if it’s raining I don’t go to the show. When I bought this car from Brown and Gammons in 2009 -this is what they aid about it:- "First registered in 1996, this UK spec car is finished in British Racing Green with magnolia leather interior and has 33000 recorded miles (now 43000 - a nearly trouble free 10k in my ownership). Also benefits from: Engine upgrade from Maidstone sports cars including new cylinder heads, lightened fly wheel, fast road cam and rechipped ECU, retrofitted air conditioning, steering and suspension upgrade by Frontline, Powerflow stainless steel exhaust, Pioneer CD, A VERY QUICK CAR!" Its a thrill to drive - pure power and excellent performance I understand the engine upgrade increased its BHP output significantly (as if it needed anymore power). History or Comments: The V5C slightly mysteriously states it was registered overseas and "declared manufactured in 1995". Its VIN suggests its one of the last made. Its wheels have long ago been replaced and from what I understand this can only be a good thing. The alloys are in good shape. There is no spare tyre which means there's plenty of room in the boot (the absence of a spare is now normal in new cars such as the Honda Civic I bought last year). 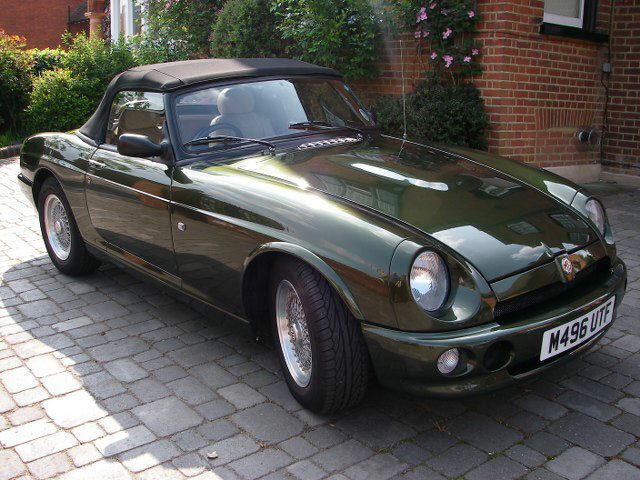 I have full MOT and from this month and six months tax. I put a new roof on it last year and full rust treatment to the sills the year before. 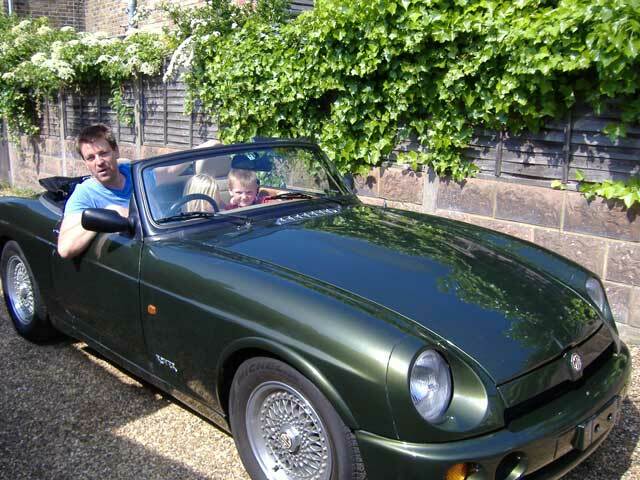 I cannot see any signs of rust on the windscreen. Paint not perfect but very presentable. 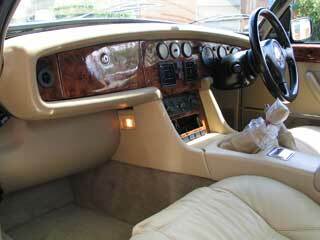 The interior is in very good condition. I have embellished the gear stick with a fine walnut MG knob (but have the original for purists). The sound system is superb. I have looked after this beast with affection. 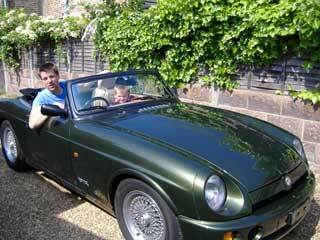 I bought it from B and G for £12k and have spent more than £3k on it over the last 4 years. I have full records of MOT and all works done on it. A pristine MGR V8 which has been cared for and garaged by the Japanese owner since new. 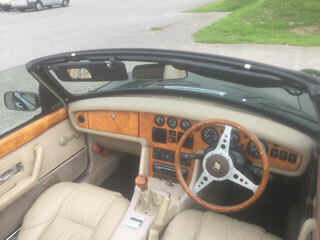 The elm burr dashboard and door caps are dark and clear. A full tool roll and tonneau cover are included. 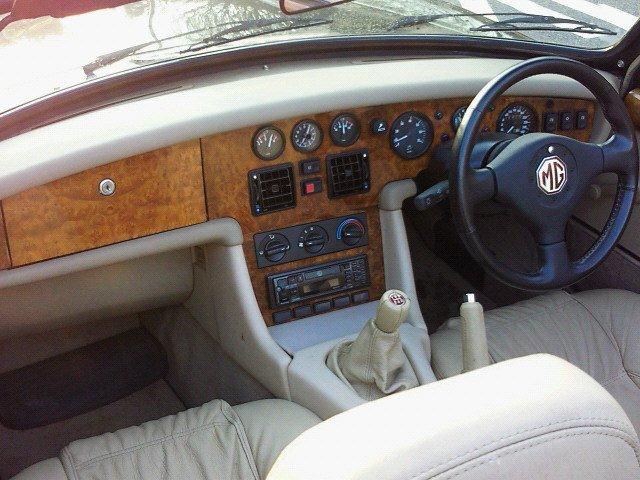 MG wooden steering wheel, window winders and gear knob are the only accessories. 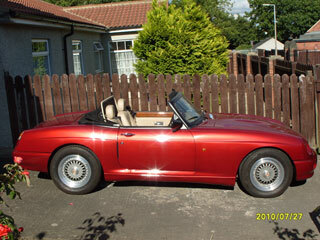 Air conditioning, almost new tyres and well maintained. No accidents. The service and instruction books are intact and come with this MGRV8. We are keeping this MGRV8 in secure storage in Japan and can export worldwide. 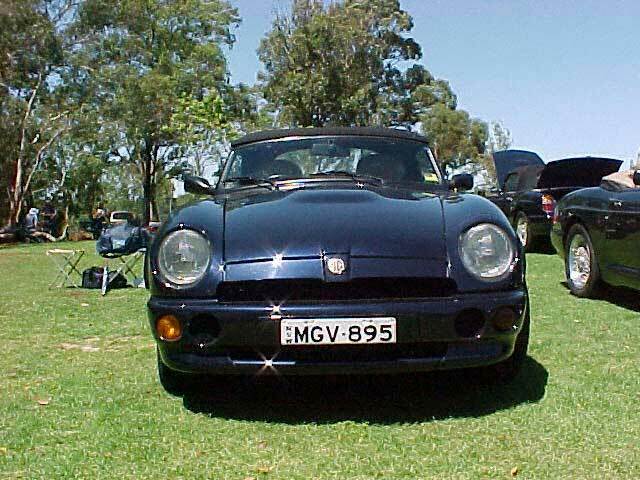 MGB bodied RV8 development car. 27000 miles. Original spec. as when it left Rover. I purchased the car in 1999. 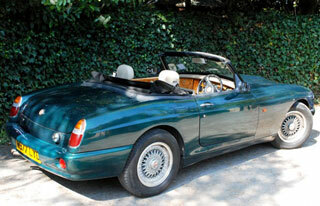 It is in good condition and a great car to drive. 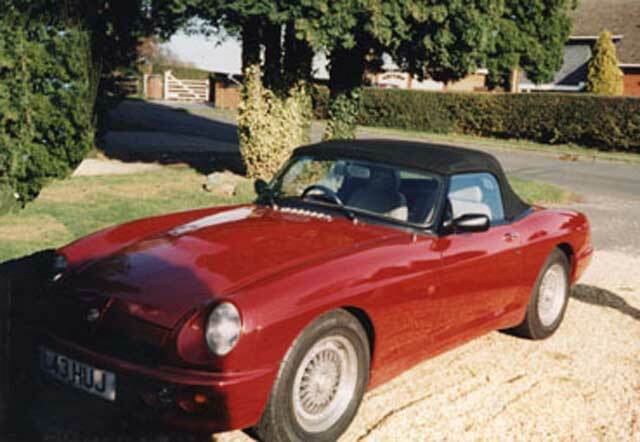 2nd development car hand built by Mark Gamble in 1990 using a new heritage shell. Known as DEV 2. it was used for preliminary evaluation. Also cold climate teating in Scandinavia. Full documented history file. 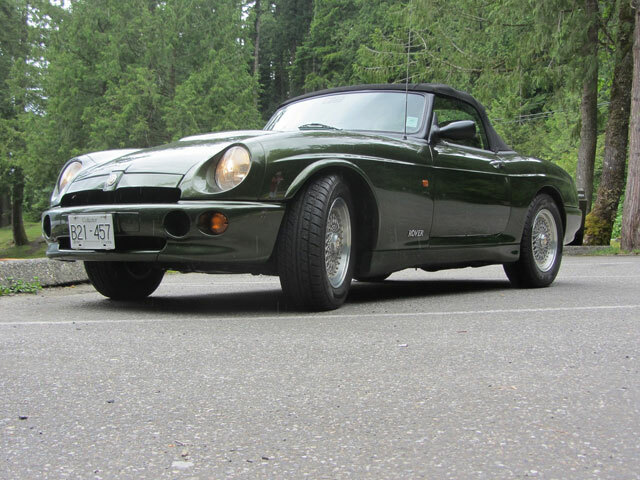 A rare opportunity to own a piece of RV8 history. Nice MGR in good condition. Windscreen has usual problem but is honest and not bodged up for sale like so many cars are. Covered just 43,450Km (27,666miles) New set goodyear tyres and MOT till May 2014. 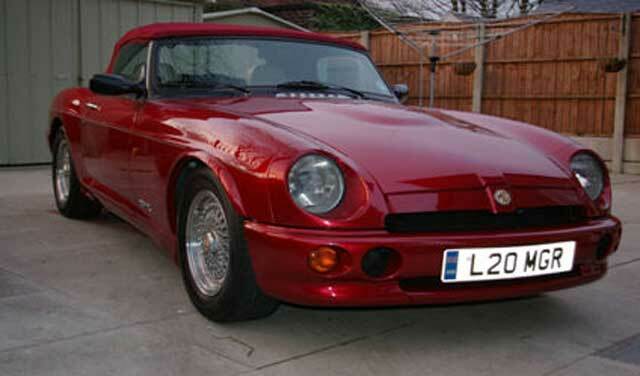 Nice "eye brow" wheel arches amd chrome bezels, interior is very tidy. comes with full tonneau cover. Fitted Kenwood cd/radio but I have the original multi cd plus radio if you want it. 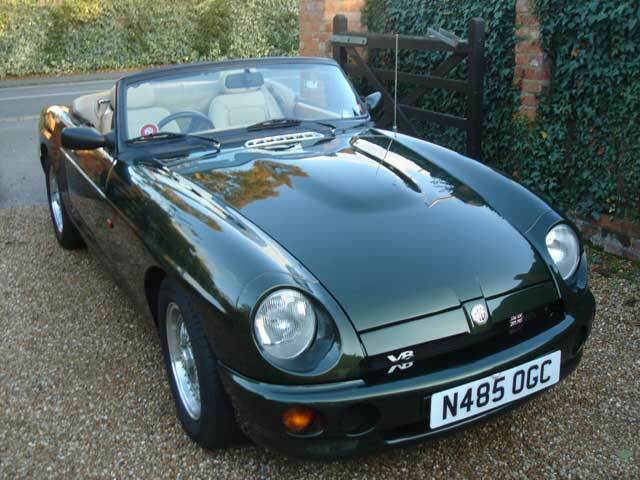 Build date 20th December 1993, exported to Japan where it was registered on 30 May 1994.Re-imported 2002 and registered in the UK June 2003, dry stored for two years until my purchase in August 2005 and garaged since then. Has covered just 4750 miles back in the UK. 1996 MGRV8 in Woodcote Green. One owner with all the books and a MGRV8 brochure in English. ONLY 2000 Kilometers from new! Excellent condition inside and out. 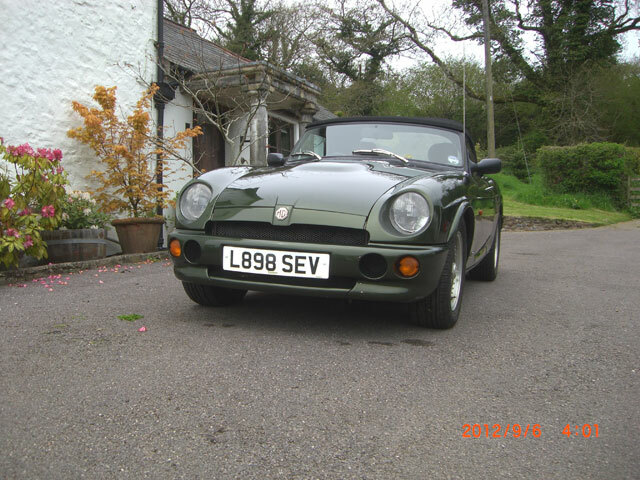 Any questions and requests are welcome for this extremely low mileage MGRV8. One owner with all the books and a MGRV8 brochure in English. LHD factory RV8, dark blue in good condition. Roadworthy for the Netherlands (LHD lights) but original RHD lights available. 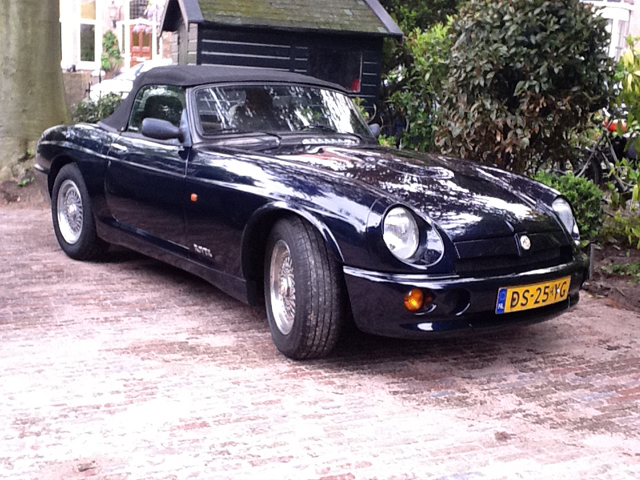 Japanese original, came back to England, now in the Netherlands. 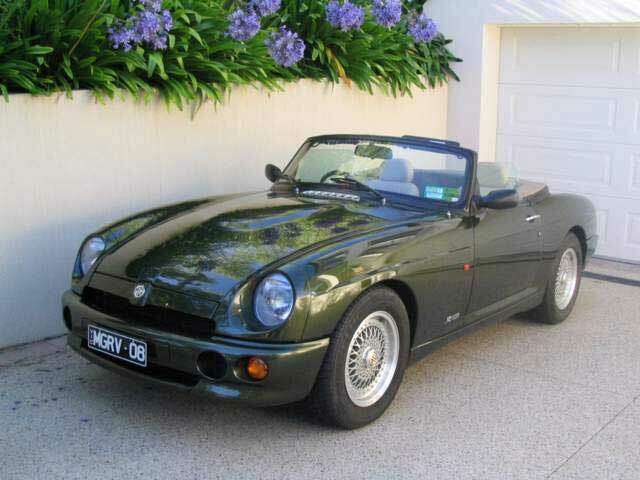 this is one of the best mg rv8 i have ever seen! too many details to list here - so if you are truly interested - please contact me. 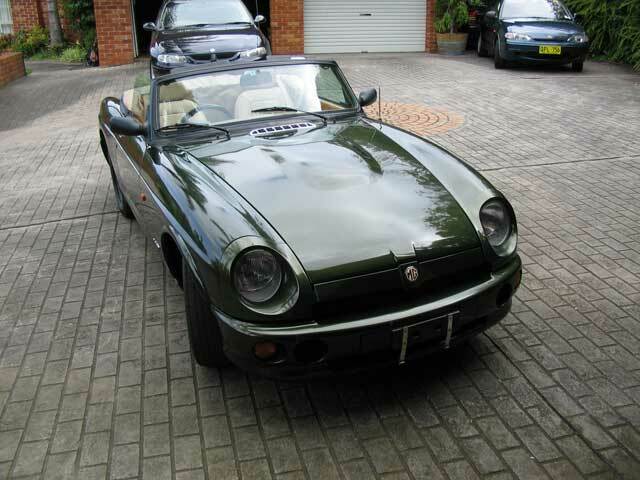 I can arrange containerized shipping or ro/ro shipping of the mg rv8 from canada to australia at a very reasonable cost. Now with UK MGR registration and one owner having covered an additional 7,500 dry miles. Speedo and other dials have optional chrome bezels. Original Owners Handbook, Maintenance Manual, Audio Hand Book and Sales Service Network book complete with green leather wallet. Both sets of keys and remotes. Stored in dehumidified garage. Draper Battery Master battery conditioner. 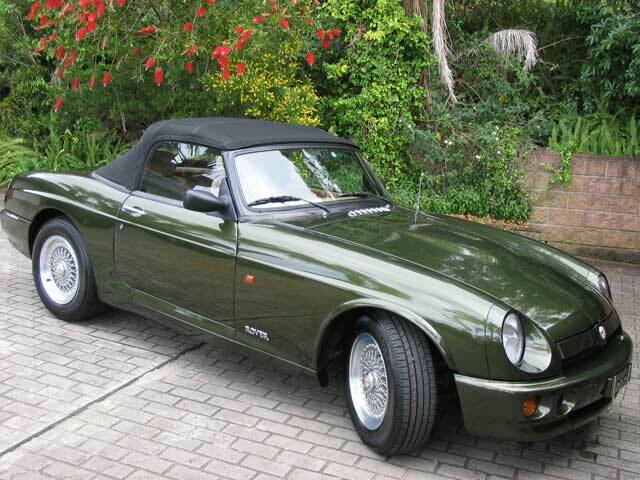 Classic Additions custom made indoor car cover with MG logo. Starter motor replaced by H S Imports. Battery replaced 2010. Very original car. Well looked after. Wood remains dark and un-cracked. Leather clean and unmarked. Working aircon. Rust free. 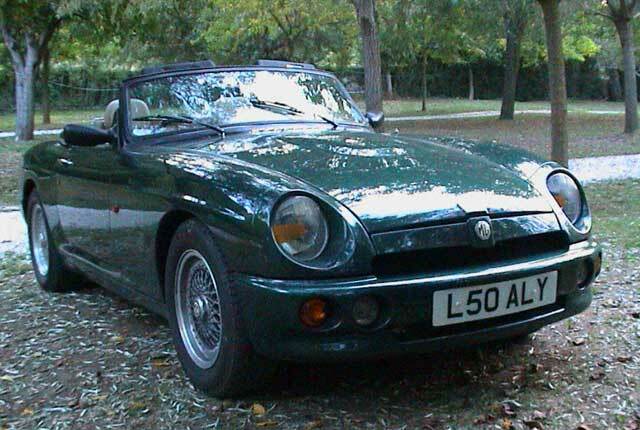 Taxed until February 2011, MOT until May 2012. Peter Best agreed valuation £17,000. History or Comments: Built 19 July 1994 and first registered Japan 7 December 1994 (one lady owner). Re-imported by Chris Watkins of H S Imports.com Ltd in February 2004. 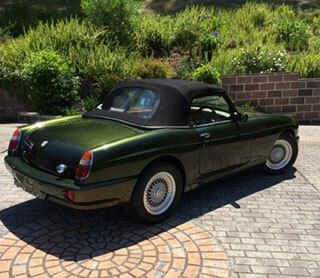 The car was awarded Grade 4A at auction in Japan. Most imports are Grade 4, which means a good, standard, straight used car. Grade 5 is as new. 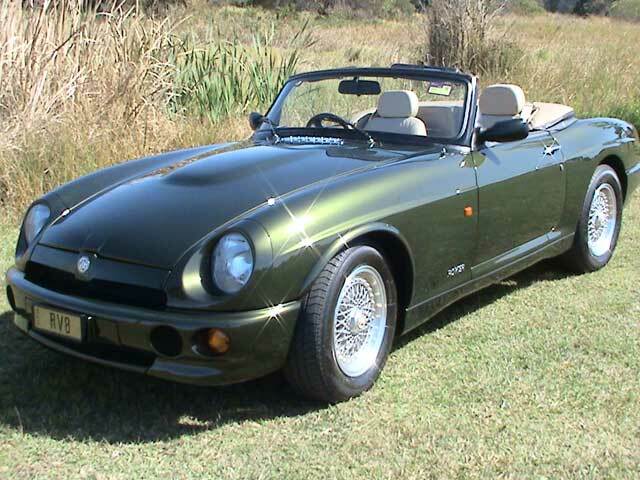 On a car of this age, Grade 4A was as good as it gets. Japanese service history, along with English translation. Original speedo (18,101 Km - 11,247 miles) available. 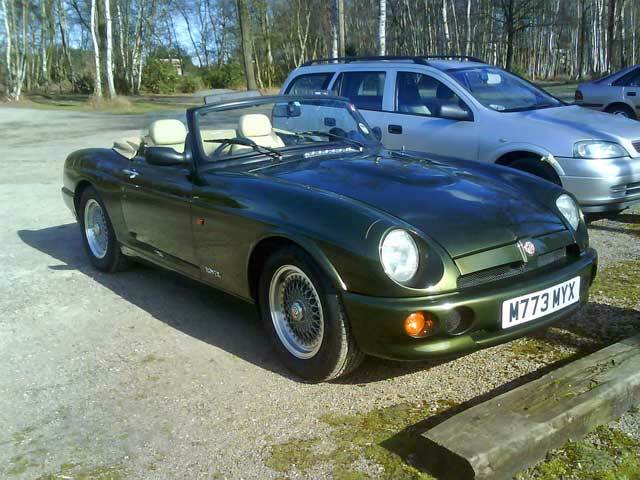 Beautiful condition, with rare POWER STEERING, 22000 miles, Woodcote Green, immobiliser, CD player, MOT to March 2012, MGR number plate included, hood in perfect condition, new back window, tonneau & bits, all the usual stuff, Koni shocks, optimax chip, spare mats, sports exhaust fitted plus original in store, elm gear knob. 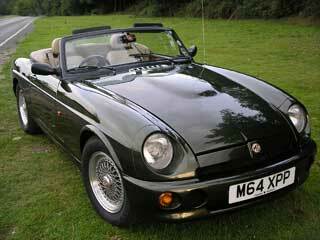 Has been my every-day car for 18months, totally reliable, they call it 'The Ultimate MG'. If you're thinking about buying an RV8, don't buy until you've driven (or parked) one with power steering! Call me for a test drive. Happy Hunting. 35,400 miles; Good condition; Some scratches and chip marks on the body work and a little rust around the window. 2 owners. Many new parts. Relucatant seller. Kept in storage from 2005 to 2008. 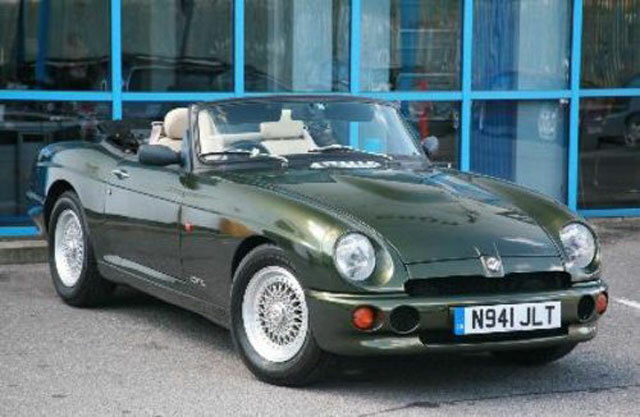 Garaged from 2008 onwards. Car purchased from original owner in Japan in 2008 and shipped to Australia where is was complied by RV8 Cars in Sydney. 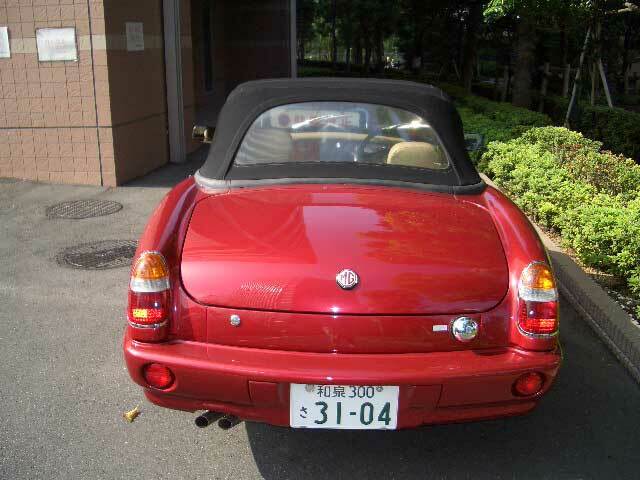 I also have Japanese documentation of first registration in 1998 and original marketing material from Rover Japan dealership kept by first owner. 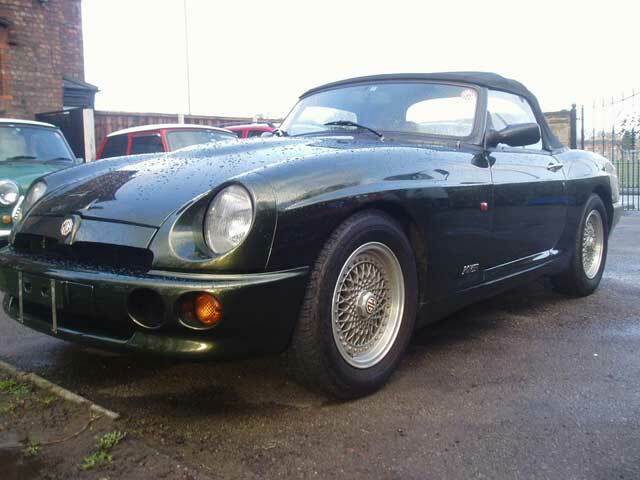 Excellent overall condition, good hood and paintwork, perfect woodwork and leather faultless machanically,very cold air conditioning,new stereo/cd with bluetooth,koni shocks,original unused toolkit,tonneau and storage bag,engine immobiliser,always garaged. Please contact for extra photos. On of the best MGR's in the land a delight to drive and very economical at 12 klms/litre. Queensland registered to 08/10 travelled 45,000 klm ( only 1200 klm in the last 3 years )Forced sale relocating and run out of shed space. Only 12,000 miles since new. 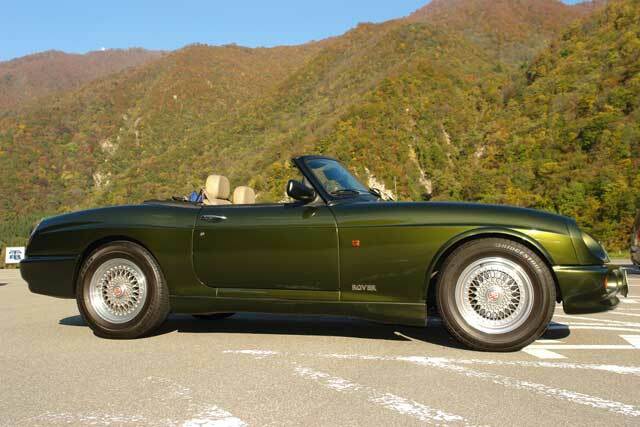 Drives superbly. All aspects in excellent condition, including engine, paintwork, interior, seats and hood. Garage stored and not taken out in wet. Full service history.This Japanese re-import comes with a comprehensive service history including translation from Japanese. Since being re-registered in the UK in February 2008 only driven 1100 miles. 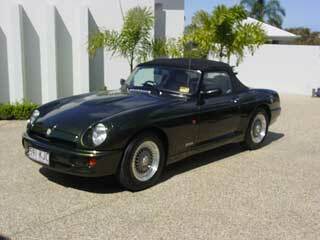 It comes complete with its original alloys, complete tool kit, flare, original radio, MG key fob. Immaculate and well cared for, very rare RV8. Only 7,200 miles. Full history. Garaged, all original fixtures and features with spares. MGR Registration. Manufactured in 1996 and reimported from Japan in 2006 with only 10,000 kilometres on clock. Only 3,000 miles since in UK. Fitted alarm. Full service history. 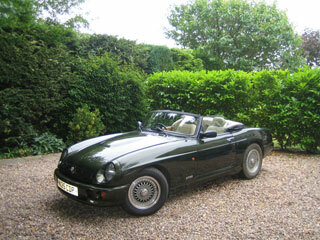 Taxed and MOT until May 2011. 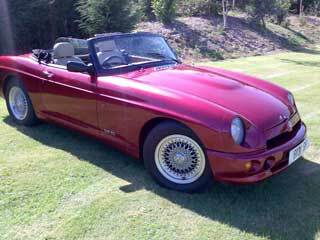 Absolutely Stunning, best of class concours winner in rare nightfire red with red matching soft top. 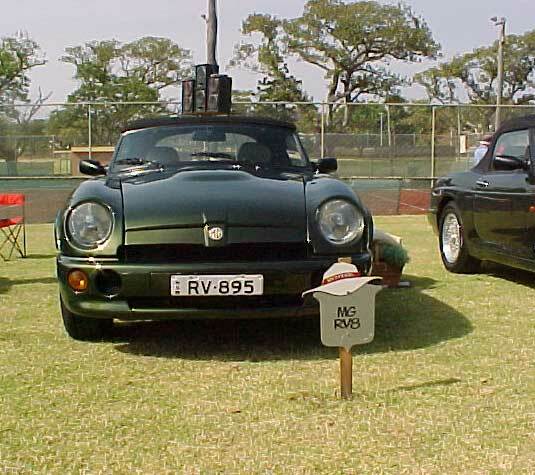 Vehicle comes complete with tonneu/hood cover original tool kit/wheel chocks/floor mats also has its original MG radio cassette. 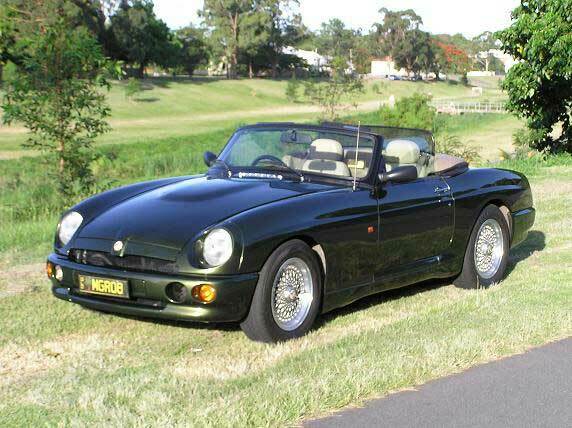 An absolute head turner that attracts immence attention, comes complete with an age related MGR number plate. 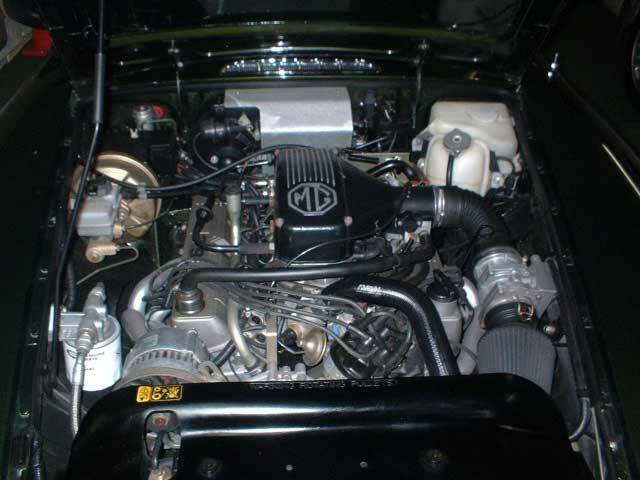 26,000mls from new re-imported in 2001, with all documentation/service records/handbooks, includes MG Rover conformity certificate,totally original, two owners from new. Exquisite example of an MG R V8 Roadstar imported in March 2003.16,500 Sunday driving miles. 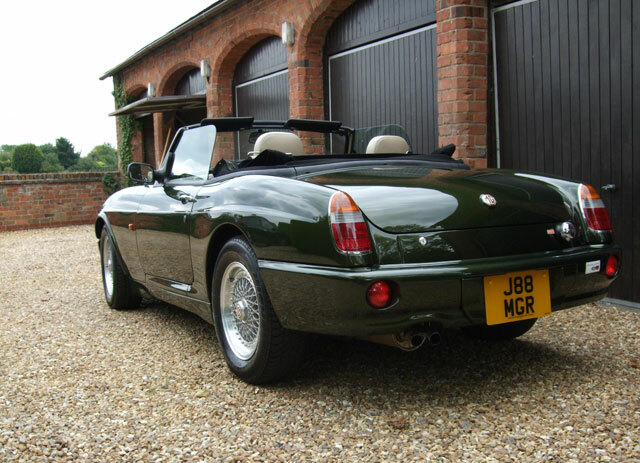 Metallic Green, Cream Leather upholstery, 5 Speed Gearbox, Fitted Alarm, Full Service History inc. all receipts and invoices. TAX until August 2010, MOT until March 2010. Sold with cherished numberplate 'T9928' worth circa £1500-£2500 (invite any buyer to have it valued). 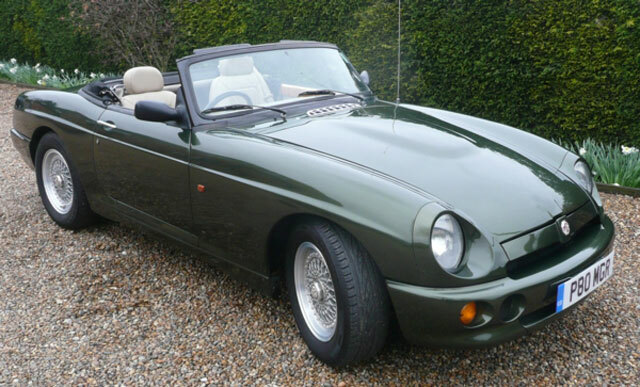 Woodcote Green 1951 (1996) - excellent low mileage RV8 for sale in Category 1 condition. 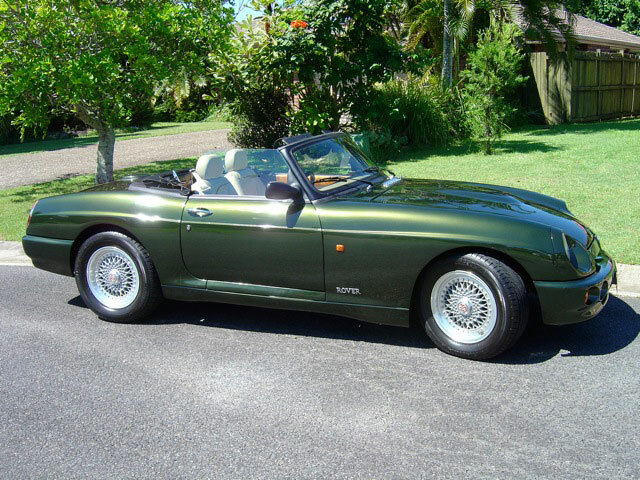 Manufactured in 1996 and reimported in 2003 with only 6,034 km (3,750 miles) on the odometer when reimported. Approximately 5,000 miles currently on the replacement odomoter, meaning car has been driven for less than 9.000 miles in total. Full British service history. Car has air conditioning and stone beige leather interior. Price is £14,500. Excellent condition. No rust all in perfect working order. Only 58,000 kilometers. 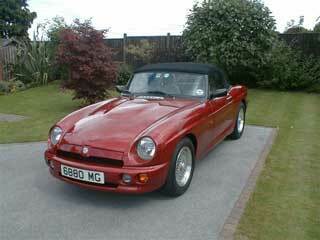 Accident free and serviced by MG Konan. Tools, cover including bag and poles. Spare wheel~all included. More photos on request. Full history in Japan, just fitted a new clutch. Recent Japanese Import, Excellent Condition, Original Tool-Kit, Log Books, Torneau Cover, Sold Unregistered and to be complied by RV8 Cars Australia. 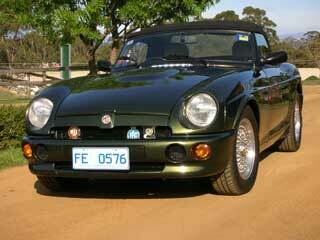 Fully imported from Japan and complied by RV8 cars Australia. Registered to June 2010 with new Tyres,battery and alternator. 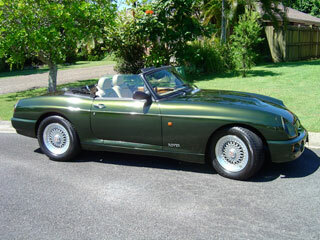 The car has full service history and is in very good condition with only 29,000Km travelled. Immaculate presentation and a perfect example of a low kilometre care. A very original example of the RV8, with only 8697 kms and always garaged. One of the last RV8's to be manufactured and complied by Stuart Ratcliff, RV8 Cars Australia in 2007 with 7900 kms. Power steering fitted by RV8 Cars. 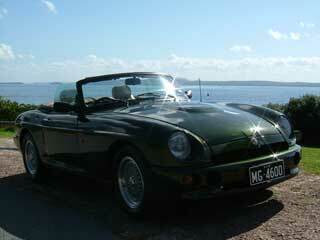 Includes tonneau cover, factory airconditioning, original tool kit, flare, floor overmats. 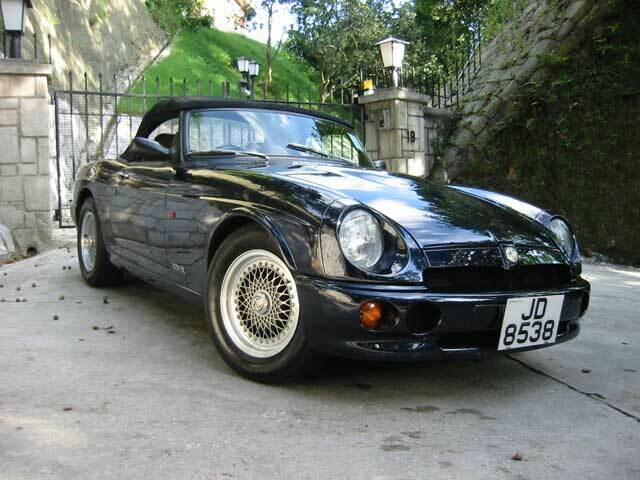 Immaculate paintwork and unmarked alloy wheels. Original unused spare rim and tyre. Includes a range of spares, including four wheel centres, spare wheel cover, headlamp surround, extra remotes and speakers. 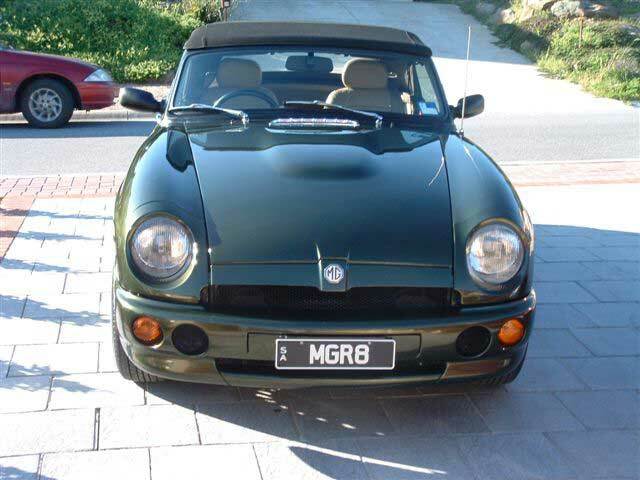 Registered in Queensland and also have unique WA registration plates "MG RV8" for sale seperately. Japanese import with full japanese service records. All original import documents can be provided. Excellent paint. No rust, very good interior. 33000kms. New stereo, Bluetooth, Amps and speakers. I Imported vehicle from Japan in 2007. Japanese service manuals, import documents and compliance documants. Rarely driven. Time to sell all vehicles to makeway for 4x4 and motorbike. Reg. ARE 87H Nov '08. 16,800klms. This vehicle currently has 39,900 KMS with a fully documented service history. 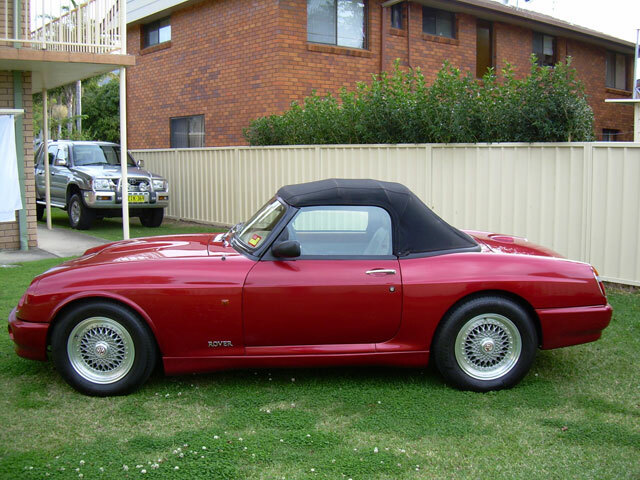 I have been the 3rd owner and the vehicle is in very nice condition. The vehicle is stock standard and comes with the original tools. There is no sign of rust or corrosion on the body with only minor surface rust underneath. There are a couple of minor pin dents on the body but the overall condition is very good. The engine and transmission are in good working order. If you are interested, please contact me and I will send you through a full picture set. 18,910 km. New tyres. Immaculate condition. Soft top is like new. Just serviced. 12 months rego. Recently imported from Japan. Fully compliant. Log books. This would be the finest MGR available for sale in Australia today, a National Concours Winner,only travelled 12000ks. Immaculate Paint, as new Leather Seats, Excellent Carpets, New Soft Top, Always Garaged. Extras 2 Spare Original Wheels. Extra Car Mats. Spare Windscreen. Half Tonneau. 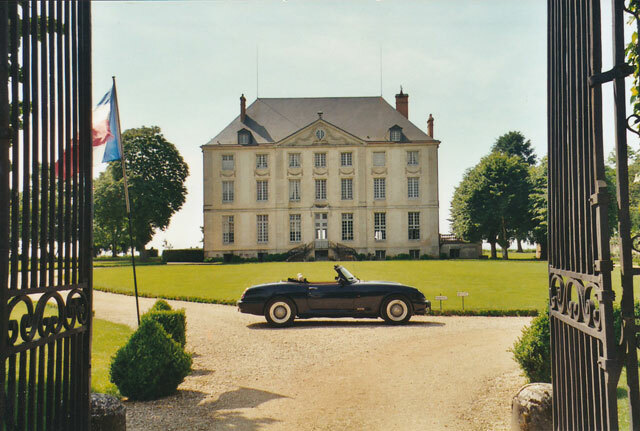 Full Tonneau. Top Down Wind Deflector. Factory Flare, Factory Tool Kit. Log Books. Service manual. Will deliver free. 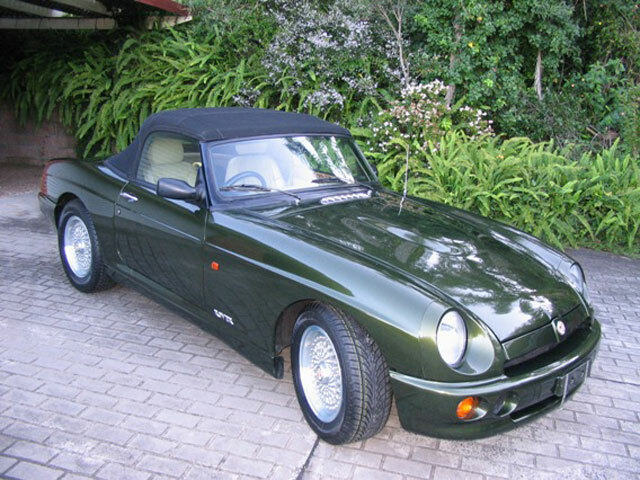 Absolutely perfect condition inside and out, polished daily , fully garaged, very good hood and paintwork, travelled only 31000 kilometres,woodwork and leather perfect, tyres like new,cd player, mg toolkit, airconditione, alarm registered with the british industry heritage trust. Purchased from aa automotive, adelaides premier mg and classic workshop in July 2007 this is a very reluctant sale due to family illness. SHAKKEN (Super MOT). Nightfire Red. Air conditioning, new tyres. MGRV8 first reg 21.2.1997 one owner with full service history this was used as a show car in a rover dealership until 21.2.1997 then sold to its one and only owner it is one of the last cars sent to japan is in superb condition will be regon a r plate and have 12 months mot and six months tax. Chassis no 2148 72000 kms 10 service stamps all from supplying dealer complete with tool kit hood cover and overmats and a one owner car. This car needs no description. It is an original MGRV8 with only 1,100 Kms recorded in the 12 years since registration from new in Japan. Always kept inside an air conditioned garage. Price on Application. Many other photographs are available. Excellent condition. Regularly serviced and maintained. All original spares and parts, air conditioning, CD Changer, MG toolkit, tonneau cover etc. 45,000km. 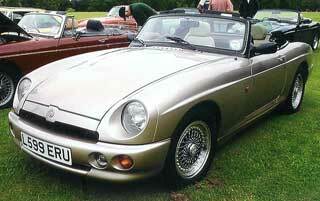 MG RV8 Registration Number M69 RVP. 30,000 miles. Serviced by Peter Edney used occaisionally and kept in the garage. This example is immaculate and is only for sale as I do not get enough time drive it. 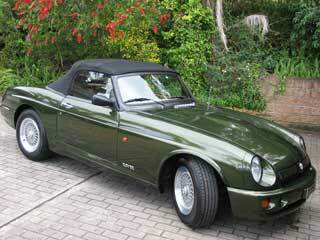 Also hard top available separately. Currently kept near Stratford on Avon. 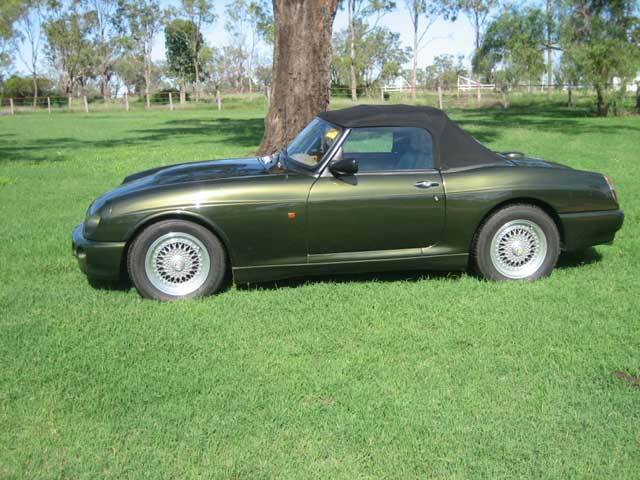 1995 RV8 Woodcote green , rego Aug 2006 , 21000 klms , Full and half tonneau covers. Excellent condition. Purchased here in Japan 1995. Now 39000kms on the clock and in great shape.It is VIN Number 1109 and I still have original unused tools roll. Unused spare. 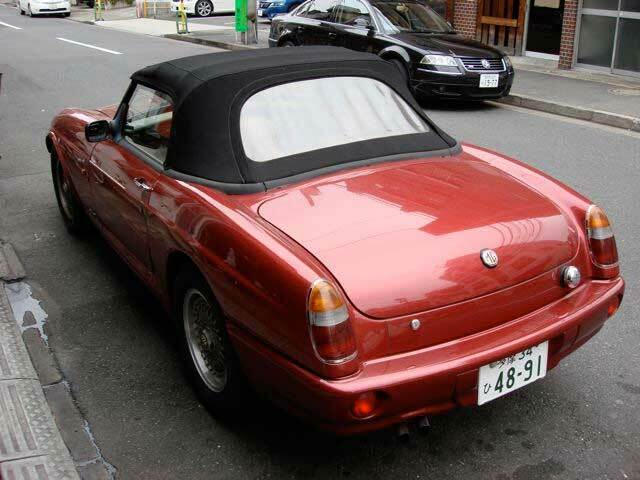 No tonneau cover and Japanese language service history. No rust around windscreen. Had to have some new welding done on steering rack about 12 months ago. New clutch plate about 5 years ago. Car runs VERY well and been in covered parking for 10 years. Larger than original CD Player and new wooden gear knob. Call Colin on +81 90 8773 0907 GMT + 9 hours. Very rare nightfire red. Standard spec except for upgraded Kenwood mask stereo. RV8 in nightfire red 19500 miles 12 months,mot 6 months tax, new exhaust, tyres, japanese import koni shocks, tonneau cover, air conditioning, wind break, all in very good condition always garaged. 1994, 37,000 Kms. Woodcote Green, service books available. treasured since new. 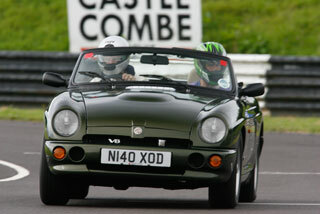 Very well maintaned and is one of the "tightest" drives you can ever experience in an MGRV8. Highly recommended buy. Very good condition, Log books,49,077kms and original tool-kit included Recent Japanese import, One previous owner, Complied by RV8 cars of Australia, Ready to be registered. Lovely rare colour, British, 37000 miles, multi-cd changerand tracker fitted. GARAGE STORED SINCE NEW. Imported from Japan, stored in a garage only 500 miles. Exceptional example of this rare car. Original in every way. Always garaged and dry use only. Genuine 20,000km since new. Factory CD stacker. Complete tool roll and all books including original sales brochure. MG overmats. Hood and leather in excellent condition. April registration. 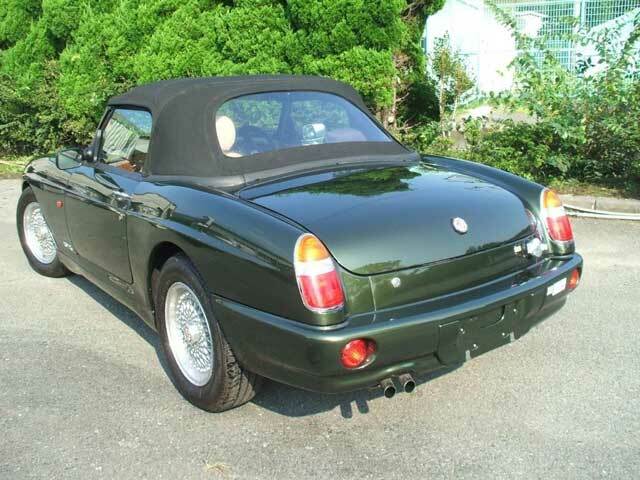 Reluctant sale to make way for a BMW (sorry, my wife made me do it!). Japanese specification. 1 carefull Japanese owner before me. 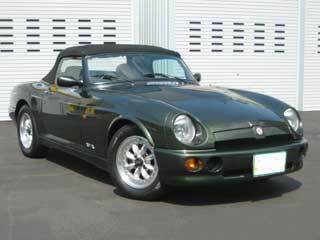 Imported and complied to Australian Design Rules by Jim Brown at MG Car Centre and chosen from a rust free area of Japan. Windscreen frame rust proofed. Elm Burr dash and door cappings re lacqured in England. 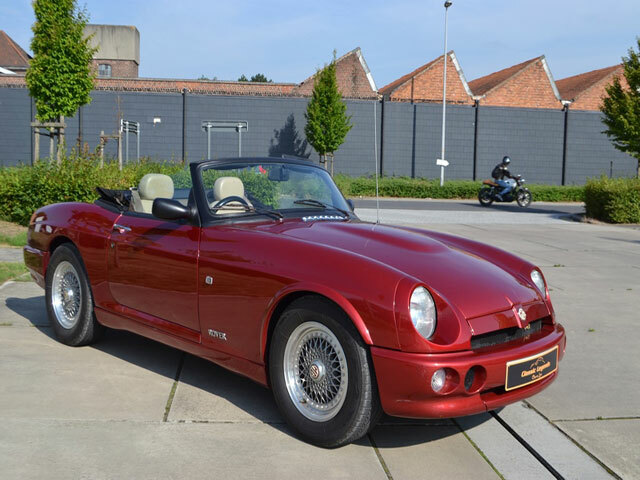 This is a rare opportunity to own a unique hand built MGRV8 sportscar with only 7900 kms from new, & only one owner who has travelled all but 500 of the total kms. The 4 litre V8 engine is only just run in and the transmission is the stronger R380 5 speed manual which was only installed in the later cars. 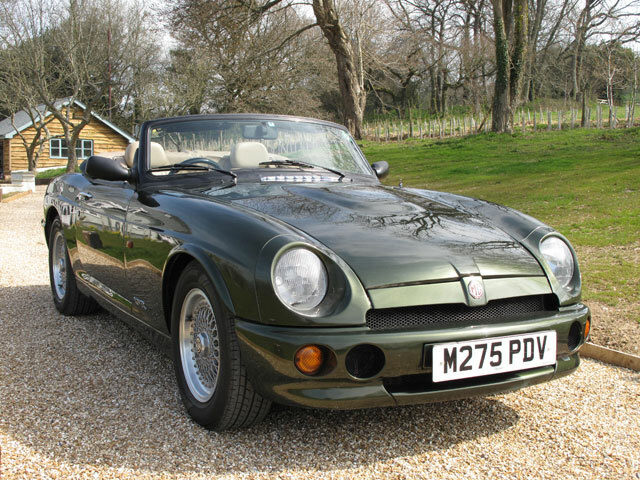 The car has all the usual RV8 refinements and is finished in woodcote green with stylish beige leather interior & is complete with tonneau and hood cover. The spare wheel is brand new and has never been fitted. This car was imported into Australia from Japan in November 1999 with only 795 kms. 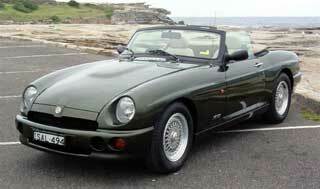 I purchased it from the importer who arranged for the Australian compliance by Stewart Ratcliffe of RV8 cars. 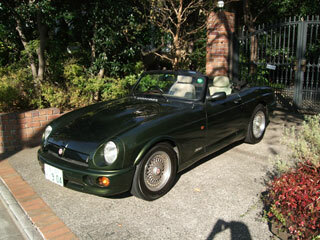 I registered the car in 2002, and since then I have used it only in dry weather and on weekends such as MG runs etc. The car has always been garaged. All original import documents can be provided. An extensive respray to Platinum Silver from original colour of Woodcote Green. Door, bonnet and boot shuts all match. I learnt the respray cost more than I am selling the car for! Which is 7000 GBP - FOB Japan or 18,000 AUD -FOB Japan! Rare Colour, Excellent Condition, travelled 35,500 miles, full uk specs with registration plate M40 MGR. 12months MOT and 6months Road Tax. New Tires, full tonneau cover, mats, tools, wind deflector and cd player. Immaculate condition. Multiple trophy winner 04/05 MG Nats. 38,000klm. Some hard to get spares. Full ADR. Personal Plates MGR39. History: This vehicle was originally owned by Steve Fawcett. 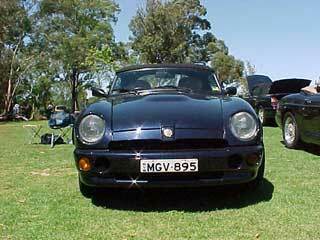 This rare Oxford Blue RV8 was my father's much loved car before he passed away. In immaculate original condition and only a weekender drive, it now needs a new owner who can care for it as my father did. Modified to Australian standards and imported in 2000, it was one of the earlier imports (#48 in Australia). 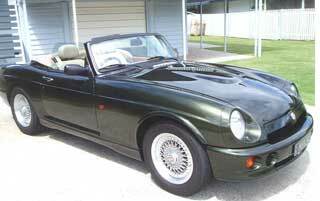 Full service history, owners manual, and MG and RV8 history and log book available. Priced to sell. 1996 (Sept) One owner from new. 7,290 Kms with history. Everything original, tools, cover (inc poles). No rust, always garaged and in the 720 kilometers driven anually were in dry conditions. 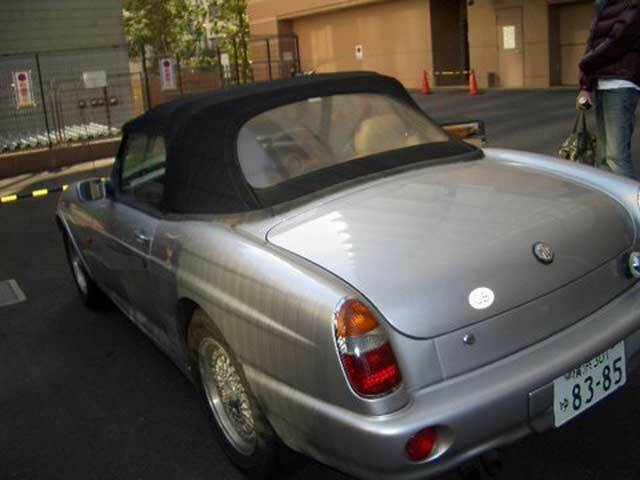 It has the Japanese "shaken" or super MOT until September 2007 which will appeal to a Japanese buyer. Nihongo OK! Can be exported, no problem. My own MG RV8. 18200 kms. Service history, tools, tonneau cover and poles. One of only 110 ever made. 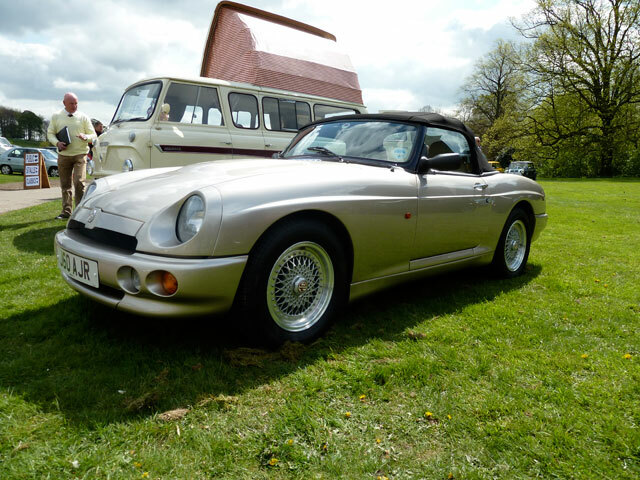 Superb condition throughout. 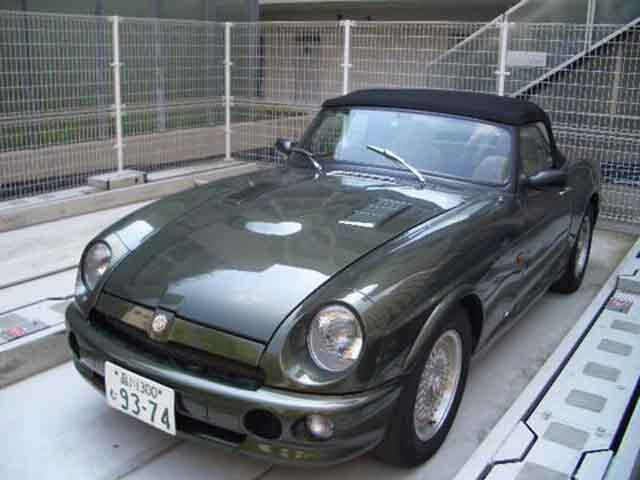 A 100% original Japanese spec with airconditioning. Comments: Purchased in Japan with only 2000kls in 2003. 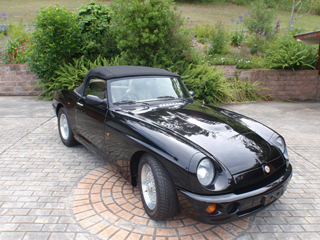 This RV8 has travelled 58300km but is in immaculate condition. 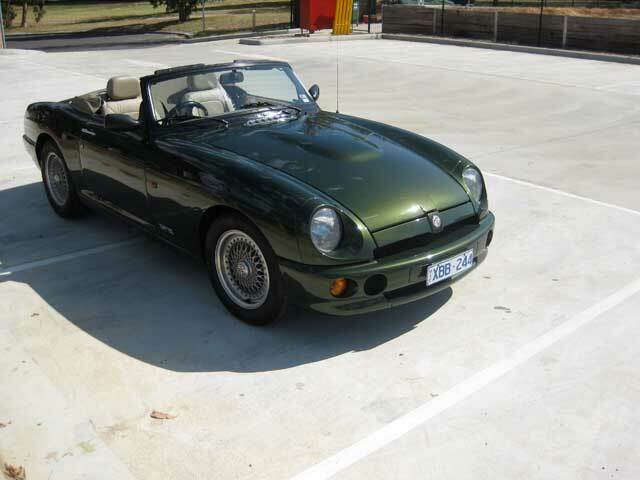 Originally imported & complied by RV8 Cars in 2002, has travelled only 5000km since. Has 6 stacker CD, remote locking & alarm, half tonneau, all tools & books. 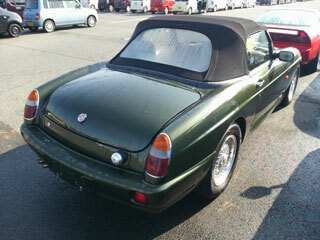 Japanes Re Import having covered less that 11,000 miles, lovely condition, with good interior and veneer. 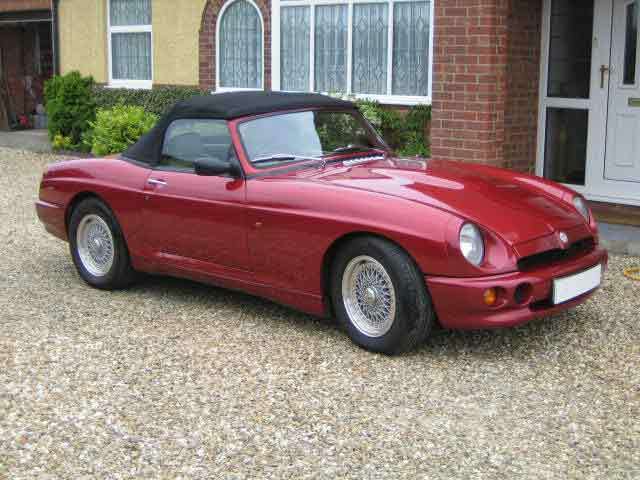 Includes CD changer (needs cartridge), Tool Kit, Jack etc.. Has a new MOT and is about to be registered. RV8 32,000klm ,New tyres,wheel cylinders,water pump,soft top,woodwork. Has half tonneau & bars. In dash CD player and uprated front springs. and has been kept in excellent condition. Car will be registered for 12 months after purchase. 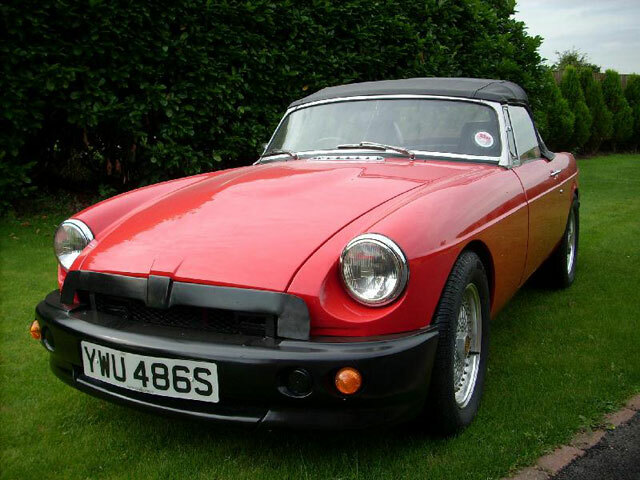 This car has finger tip steering, uprated springs for correct ride height and corrected castor angle to improve the steering and reduce heavy understeer, making it a delight to drive. The car is in perfect condition with everything working as it should. 50,000 kilometres. I ordered this car and have owned it from new. It is in superb condition inside and out including the leather trim, elm burr veneer and alloy wheels. 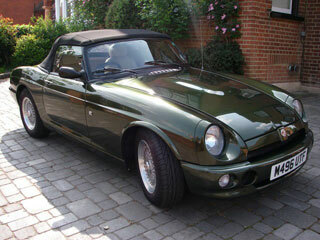 Even the paintwork on the inside of the bonnet shines like new! The car has a full service history by the supplying dealer. All receipts and invoices. 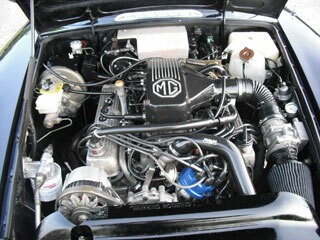 MOT to June 2006. 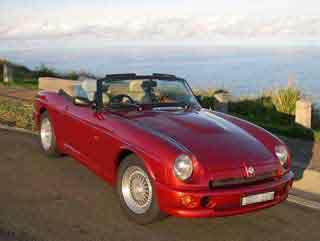 Taxed until March 2006. Just serviced. Mileage 18,205. Unused spare wheel. Japanese spec with air conditioning. Four brand new tyres (unused spare). Sony radio/CD with six speakers. Half tonneau and MG overmats. Immaculate condition, garaged and mostly dry use only. History: Re-imported to UK in 1998. 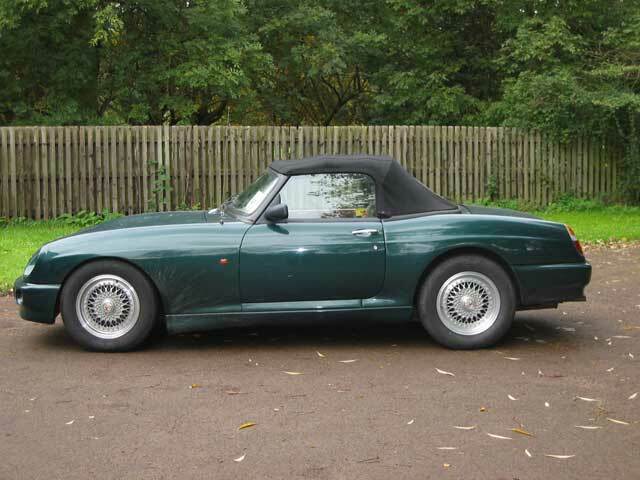 Bought by present owner from local Rover dealer in Berkshire in April 2000. Car has now done around 25,000 miles, including 8,500 kms in Japan (original speedo included). Recently serviced. Taxed and MOT\'d to May 2005. This RV8 is a Japanese specification with air-conditioning. 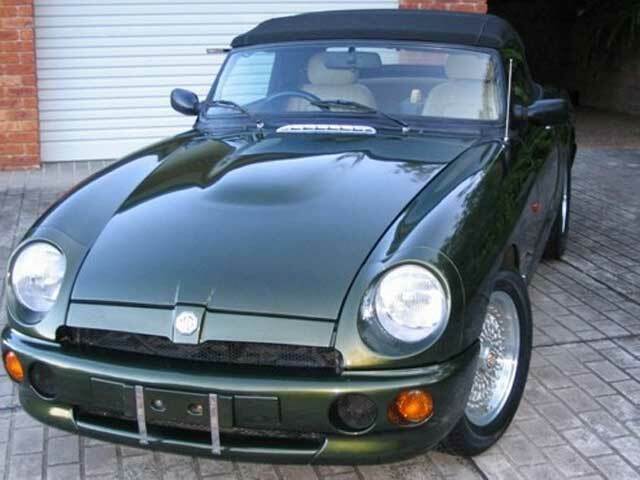 It is a personally imported vehicle, and is therefore completley original, including the original RV8 secuirty system. It has Victorian Registration with plate MGRV 08. The car is in excellent condition has has won its class at the 2002 Melbourne Concours. It has travelled only 25,000kms. 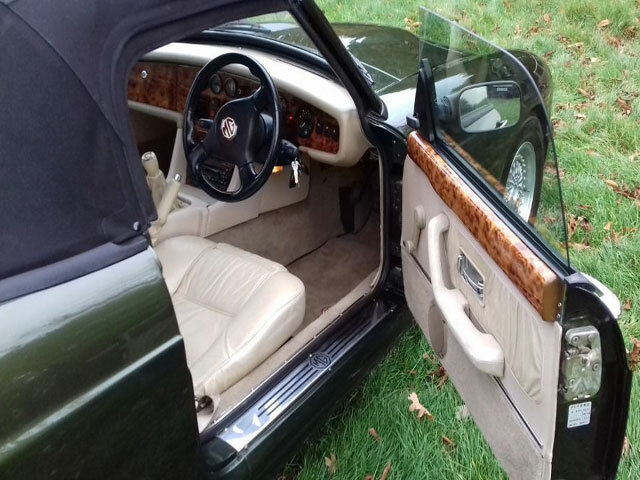 The car comes complete with ALL original accessories including tool roll, wheel chocks and jack, Rover Flare, floor mats, log books, half tonneau. An MG radio set to Australian Specifications and CD Stacker are genuine MG accessories. 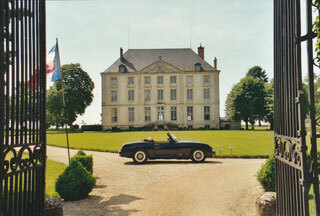 A custom made Mercedes Fabric Full Tonneau is also included. 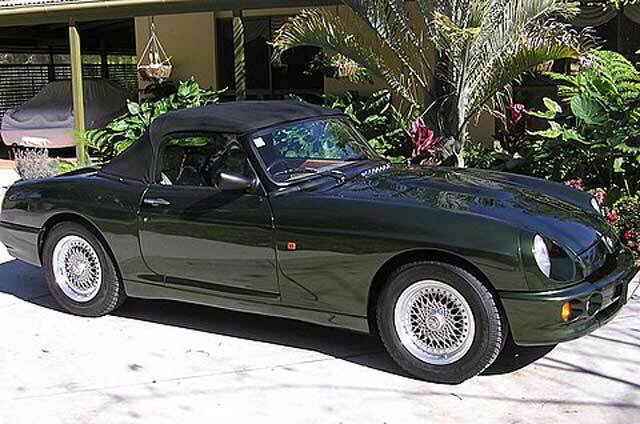 This is an exceptional example of this rare car. 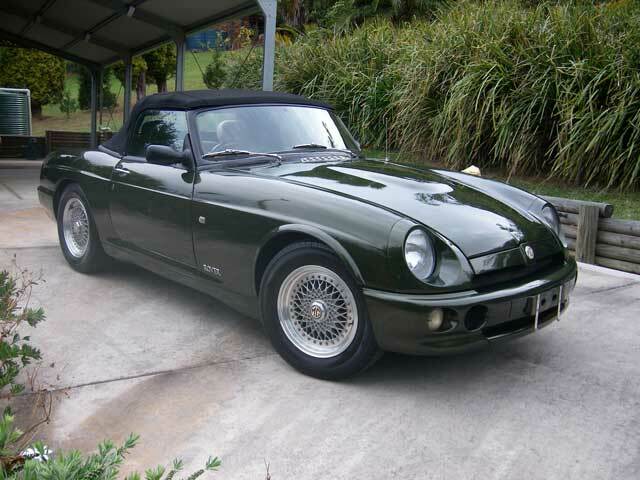 Manufactured in Great Britain and imported from Japan ( Jap Spec ). 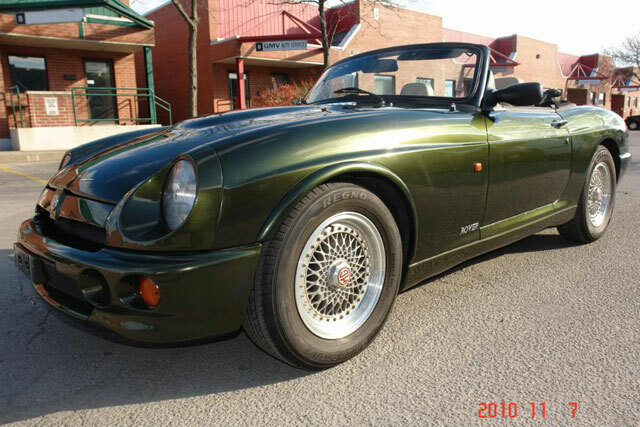 British Racing Green RV8, 37,000 miles, service history, upgraded suspension, sports exhaust, British model, 10 cd changer, tonneau cover, priced to sell. Absolutely perfect Japanese import (RV8 Cars fully compiled)18,000kms, NSW Rego Oct 2004. 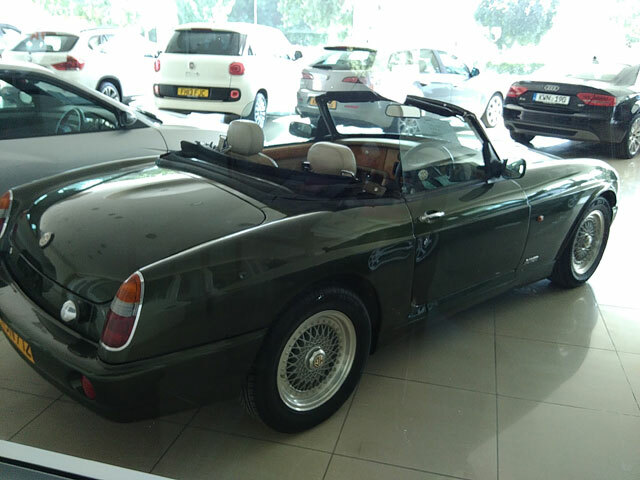 Air Con, Alarm/Remote Immobiliser with tracking, Stereo with 4 Speaker sound system, other extras including toolkit and full tonneau cover, handbooks and workshop manual, 2 careful owners always garaged and admired not driven. 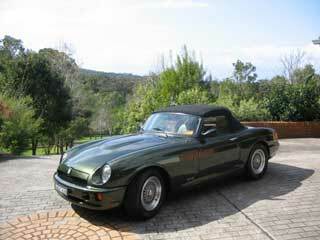 Car has been in Australia for just on 2 years, purchased with 6,500 k\'s on the clock. All service records available, including original Japanese service books. Must sell SMART car obsession taken hold. in any or all transactions or deals. after that period if owners wish to continue advertising. This policy will ensure sold items do not remain advertised.